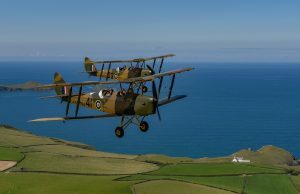 Bodmin Airﬁeld is fortunate enough to be able to repeat the visit of two wartime Tiger Moths and oﬀer you the chance to live the dream and experience the joys of ﬂying in an open cockpit wartime training aircraft over the beautiful picturesque Cornish landscape. 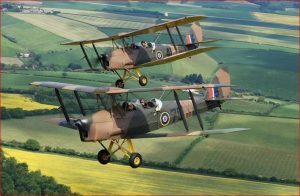 The aircraft you ﬂy in has been lovingly restored to an extremely accurate standard and is ﬂown by a very experienced pilot. On your ﬂight you will wear a sheepskin ﬂying jacket, leather ﬂying helmet and goggles to help transport you back to those halcyon days of real ﬂying. The sensational hour long aviation experience will include a walk round the aircraft with a talk on the WW2 training programme and half-an- hour in the air, when you can actually take the controls. Formation ﬂying and aerobatics are also available so you can ﬂy next to your friend or partner in another similar Tiger Moth. We can even do 3 aircraft together if needed.